We are glad to present you with a new version of Deskman, an advanced desktop security tool for administrators and power users. Deskman protects desktops, restricts application usage, and keeps systems tightly secured. Version 9 of this award-winning program introduces the ability to Freeze! running applications, a new Start Menu, a simplified Lock, and much more. 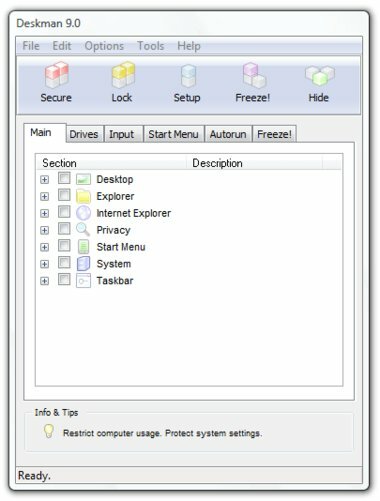 Deskman allows you to tightly secure desktops and lock computers. Combining restrictions and options you can easily achieve the desired level of security. 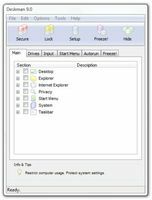 Deskman 9 is the most advanced, yet accessible, desktop security manager for Windows 2000/XP/Vista. System requirements: Minimum operating system requirements.